Thor : : Wolves of the North. 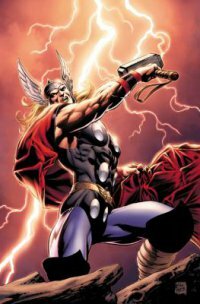 "Contains material originally published in magazine form as Thor: wolves of the North, the truth of history and Thor annual #1." Thor: wolves of the North / writer, Michael Carey ; artists, Michael Perkins -- Thor: the truth of history / writer & penciler, Alan Davis -- Thor annual: the hand of Grog / writer, Peter Milligan ; artists Mico Suayan and Tom Grindberg with Stefano Gaudiano. Collects tales of Thor as he battles demon hordes set loose by Hela, visits Midgard's ancient Egypt, and discovers that time does not heal all wounds. thor is awesome! submitted by nasuaada on July 28, 2011, 6:58pm thor is awesome! New York : Marvel Worldwide, 2011. Description: 1 v. (unpaged) : chiefly col. ill. : 26 cm.